You might recall Part I of this interview from March 19. This second part concludes our conversation with Sandy Duncan, CEO of YoYo Games and the man who set up and ran the European Xbox business for Microsoft. He talks about the videogame industry, its past, present and future, and gives some remarkable insight into the world of videogames. Sandy is a Pinot Grigio aficionado, and that is only one of the many reasons we like him. Plus his middle name is Charles, you just can’t go wrong with a guy called Charles. That VideoGame Blog’s Zee Salahuddin (TVGB): I know this question is horribly clichéd, but it’s always interesting to see what an industry veteran has to say on the subject. Where do you see the videogame industry in 5 years? 10 years? Sandy Duncan (SD): The industry is fundamentally driven by technology. I think dedicated games devices i.e. consoles (and handhelds) will die [out] in the next 5 to 10 years. The business model is very risky and the costs associated with creating new hardware are incredibly high. (Microsoft have lost billions of dollars with Xbox. Ed: And Sandy would know, he worked for the Xbox Europe division!) There is a definite “convergence” of other devices such as set top boxes. There’s hardly any technology difference between some hard disc video recorders and a an Xbox 360 for example. In fact in 5 to 10 years I don’t think you’ll have any box at all under your TV, most of this stuff will be “virtualized” as web services by your content provider. SD: Nowhere is convergence more likely to continue to happen than with mobile devices (just look at the iPhone…and iPod touch and ask yourself if these will still be different devices in 2 years, never mind 5 or 10). The next generation of “handheld” devices will integrate game play with other technologies like GPS, digital cameras, high speed mobile broadband services (at affordable prices) and phones. [The] gating factor for almost all of this is battery technology. [Nothing] significant has happened here in the last 20 years… which means this is overdue! High speed broadband is a key factor, both in the home and on mobile, [which is] why everyone in the industry is so excited about and investing in Online Games. [Game] publishers will/are having to change rapidly to adjust their business models… in 5 years the top publishers may be different companies than the ones you know today. [Look] at how quickly Popcap or Oberon are growing, or look at what has happened to World of Warcraft in the last 3 to 4 years as so many more homes have easy access to decent broadband services. 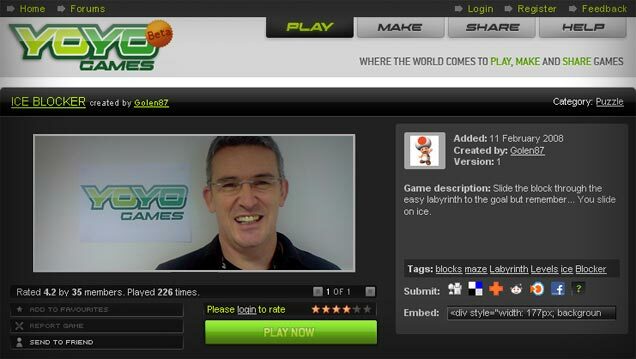 Maybe you’ll see YoYo Games competing with EA in 5 years… [and] why not ? TVGB: In the same vein, do you feel that by giving development power to the people, you may be going against the grain? For instance, giant gaming corporations are acquiring more momentum and resources by the minute. Blizzard just melded with Activision, EA has offered $2 Billion to buy out Take Two. Do you believe that the future of game development lies in a highly structured and team-work oriented corporate environment? Or does it lie in the hands of a few innovative minds that have the tenacity and originality to take it to the next level? The top video games will require bigger and even more sophisticated teams and the existing publishers don’t have people or business models that allow for “risky” innovation. Today’s video games publishers (Nintendo are the exception) are risk averse, formulaic and predictable. The vast majority of publishers are also seriously restricted by their distribution channels. Retail doesn’t take risks and makes no identifiable contribution to the value chain, so you’ll need to pay a lot of money to get something new and innovative into the shops. For sure online retailers can offer more of a “long tail” approach to retailing, but the real innovations are being driven using the internet to drive innovation, not distribution. If Activision and Blizzard can figure that one out they will lead the next generation of publishers… if they don’t, then this merger will be a very expensive mistake. TVGB: It sounds like you feel the videogames industry is in a quagmire of rehashed, predictable content. Talk to me more about that. SD: The Video Games industry has been stuck in a rut for the last 10 years. Until Nintendo came out with the (amazingly low tech) Wii last year, nothing exciting had happened since the launch of PS1 and the era of 3D games had come to the masses. [In] the meantime games have been reaching out to a new audience online by being simpler, easy to engage and quick to play and that [is] where casual games starts to kick in. Accessibility. [Not] everyone wants to have to learn all of the moves in games like FIFA or spend 20 hours playing through GTA. Many people just want short bursts of entertainment. Wired magazine called this “Snack Culture” in an article last year. More and more people just want to spend 5 minutes being distracted, [and for that purpose] Zuma or Bejeweled [are] more appropriate. That’s why 10% of the games business is now made up of “casual” games, and that’s one of the 2 main areas that have been driving the real growth in the games industry for the last five years. The next generation of games whether casual or otherwise will be heavily influenced by new talent. The next Miyamoto or Molyneux is around somewhere. The problem is, with games costing so much to produce how will we find him? Or her for that matter? The next industry heroes probably won’t emerge, as in the past from small indie developers with great ideas since the small guys generally can’t afford even to prototype a video game. [Three] years ago I would have said “look at casual games as the path to enlightenment”, but the industry has become besotted with copying other people’s ideas (how many Bejeweled clones have you seen? Ed: We did a quick research, and came up with at least 22 that we could identify in the first 5 minutes…) and is in danger of a creative implosion. There is more hope in the area of Flash games. Sites like Miniclip have some great and original content and there are a few new, talented developers emerging. The caveat with Flash is a) It’s expensive at about $800 for a full dev suite and b) it [is] severely limited in the types of games that you can create (Flash is not designed for games development). I think that Silverlight looks much more promising, but it’s still aimed at people with programming skills, so the best creative talents need to team up before they can attempt to break through. Hence the beauty of Game Maker. The “Pro” version is only $20, no prior programming experience required and it was created specifically for people to make games, unlike Flash. There’s a game on the site called “Twister”, check it out, the guy who wrote it, GreyPea is a graphics artist in the games industry, not a programmer. There’s another way that YoYo comes into play. There are no “rules” for creativity. Even the programming barrier is low or non-existent. The number of games on the site is growing every day by almost 100… and every day we see 20 or more new developers submitting content. You can submit your game whenever you want and it’s immediately available to anyone visiting the site. If you don’t think your game is [not] completely finished, then you can upload it to the “Beta” or “Work in Progress” sections where the reviewers and the community are more understanding of you as a developer. Many of the games on the site are incredibly innovative and engaging; look at guys like 2dCube, who won our “Winter” competition with “Frozzd”, and last month he released an incredibly innovative puzzle game called “Karoshi” where you need to kill yourself on each level. “Virtanen” is a Finn… and his games are simply… [different]. [Take] a look at “Seven Minutes”, it’s a game that lasts Seven Minutes, that’s original. RyGuyDavis is only 17, but take a look at some of his games, especially Lux, it fits superbly in the easy to learn, easy to play genre that makes casual games so compelling. These are only 3 examples of the tens of thousands of developers who have written and shared their talents on YoYo in the first 10 months! TVGB: Product placements have infiltrated literally every aspect of our digital and analog loves. What is your take on advertising in videogames? SD: People who write games are generally looking for reward. For some people this is just the joy of people playing their game… but for many the real motivation is to make money and maybe even earn a living from their games. At YoYo Games we will introduce the option of in game advertising for the developers later this year. TVGB: Innovation is central to any creative process. What do you feel are the best innovations in the videogame industry (concepts, games, products, software), that have really redefined or revitalized the industry in the past two decades? In the interests of impartiality, we ask that you not list YoYo or GameMaker. Very personally: the aiming/control mechanism in Goldeneye… it made it possible to really enjoy playing FPS on console and Halo would never have been an FPS without it. Dreamcast should have been on the list, but we all know how that turned out! TVGB: What advice can you give budding game developers? SD: [It’s] not about programming skills, there will always be plenty of people who will enjoy taking great ideas and turning them into lines of C++ and the hardware will less and less be a limiting factor in the gaming experience. Think out of the box; don’t just try to copy what other people have done. The next generation of stars will be founded on their creativity and not how many polygons they can push. Think about how you can creatively use the fact that almost all of your game players are connected to one another and don’t be constrained by a single device.